The project management landscape is changing. In a PWC survey, as many as 97% of organizations agreed that PM is critical to business performance and organizational success, and 94% believe that PM enables business growth. The report also found that the PM maturity levels were on a rise and the use of commercially available specialized project management software drove higher levels of performance and satisfaction with an organization’s PM practices. Having said that, finding the right software for project management has always been a challenge to buyers. There are hundreds of tools in the market and it can be quite daunting finding the right one for your organizational requirements. To make your job easier, we have gathered and compiled 10 of the best PM platforms out there that you can consider. Celoxis is an award-winning project management software to streamline all of your project management processes. 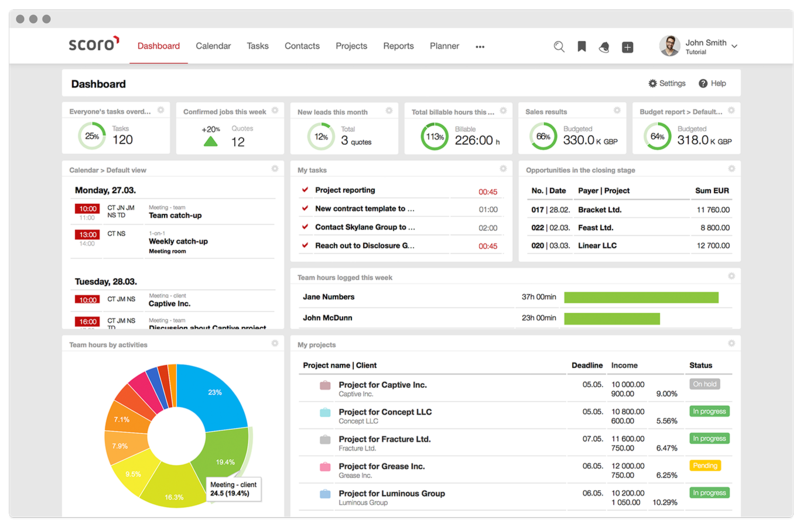 It offers a comprehensive online project management solution for midsize to large businesses to help them plan and manage diverse project portfolios. This all-in-one suite includes modules for portfolio tracking, resource management, budgeting and costing, revenue forecasting, time and expense tracking, reporting, bug and issue tracking, risk management, and team collaboration. Celoxis also offers custom apps, which are really more like workflows that you define and that are used over and over again by your team. It offers excellent accessibility making it easy to integrate into any business. Popular brands such as Rolex, Jabil, HBO, Deloitte, Del Monte, The Cheesecake Factory, University of Washington, Singapore Post, and Harman have been using Celoxis successfully for years. Celoxis is available for a flat-fee pricing, which could save you money in the long run. It is available in SaaS and On-Premise deployment options. Both options require a minimum 5-user sign-up. Comprehensive project management and work collaboration platform. Quick setup and easy to navigate. There is a good balance between ease-of-use and power. Cannot directly open, edit or mark comments for a file in the app. You have to download the file and do that work in another app. The advanced security rules can get confusing at times. LiquidPlanner is one of the most impressive and complex work-management systems in the market. Unlike every other project management tool, it allows employees to enter their best- and worst-case scenario times for tasks and their advanced priority-based scheduling engine rolls up these estimates to automatically predict reliable finish dates. The tool is best preferred for project environments marked by high levels of uncertainty in project schedules and shifting priorities. The tool also has other features like built-in time tracking and collaboration. Popular brands such as Bayer, Cisco, and Daimler have been using LiquidPlanner for many years. LiquidPlanner offers two account levels: Professional and Enterprise. Both of these account levels require a minimum of five users and all pricing is based on annual contracts. LiquidPlanner costs more than many other project management apps. LiquidPlanner has rich time-tracking and time-estimation features. Drag-and-drop simplicity and intuitive UI. A good amount of learning required to get started and a significant amount of time required in the initial setup. Very few business-friendly integration options. Clarizen is a professional services automation software that’s best suited for larger organizations and enterprises. It is quite pricey and not ideal for small businesses. With Clarizen, the workflow and business rules automation is pretty flexible and powerful, and it also offers reasonably good cross-project visibility, reporting, resource, and financial management capabilities. Out of the box, Clarizen has some very powerful integration capabilities with other tools like Jira, Salesforce, and Intaact, to name a few. One can also browse their apps marketplace to add more functionality and custom integrations. For large enterprises, Clarizen also offers custom services that include interactive training sessions and a dedicated implementation consultant to provide process guidance and help streamline adoption. Customers such as Box, Western Union, Cisco, and Sodexo use Clarizen to increase their project performance and efficiencies. While Clarizen frequently keeps changing their pricing and plans, currently they offer two tiers of service: Enterprise and Unlimited. They also offer different types of user licenses based on the level of access required. Their plans and pricing are typically based on a 36-month contract, paid in advance. Powerful integration options out the box. Customizable modules and robust features. An experienced company that works with many Fortune 500 companies. Needs implementation and professional services for successful adoption. 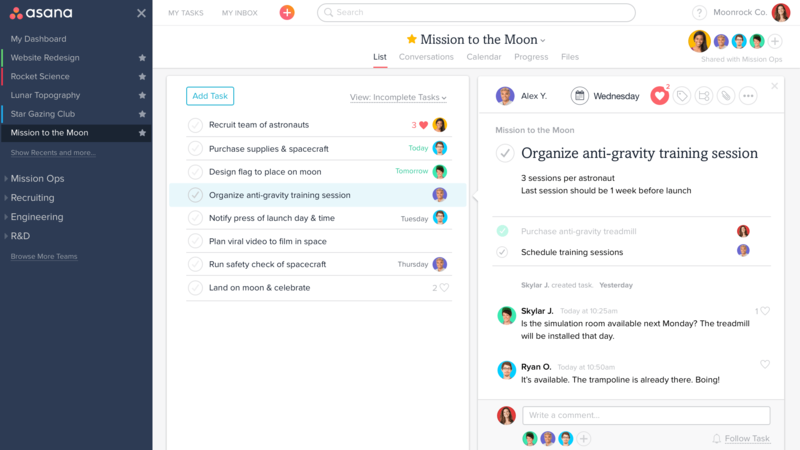 Asana is a handy platform for teams looking to move away from using spreadsheets and emails, yet not overwhelm themselves with advanced project management capabilities. Asana is an advanced to-do list software that emphasizes deadlines and due dates and brings in the nitty-gritty of basic task management including sub-tasks and a slick timeline view. Asana also offers basic reporting to track project progress and plenty of integration options to tie it all together. The software, however, has limited features and is not intended for pure project management requirements such as time tracking, resource management, and project financials. Asana is widely used globally and includes big-name clients like Dropbox, Vodafone, Uber, and IDEO. 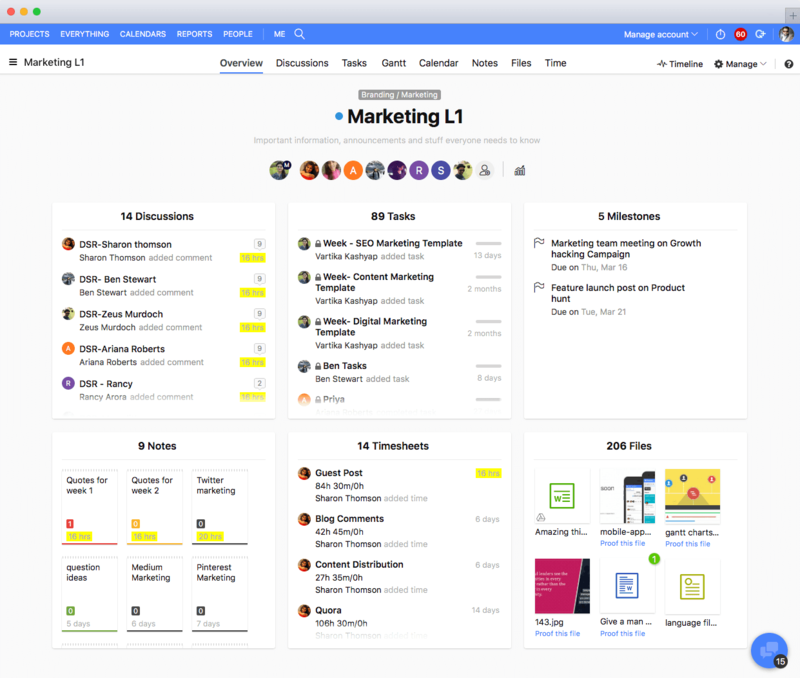 Asana comes in two paid flavors, Premium and Enterprise and also offers a free basic version. The timeline view, custom fields, task dependencies, and security features are available in their paid plans. Modern and crisp user interface. A very limited and rudimentary feature set, lacking even the basic task estimation and time tracking capabilities. Cannot assign multiple people to the same task. Because of its over-simplified UI design, the system can get out-of-control with an increased number of projects, tasks, and team members. Trello is a great tool for people who aren’t familiar with Gantt charts or project management vocabulary. It is a light-weight tool that uses highly visual kanban-style boards for project management and team collaboration. While the tool is great for teams and projects that require simple to-do lists and basic task management, Trello lacks project management basics as Gantt charts, time-tracking components, resource management, and reporting tools. 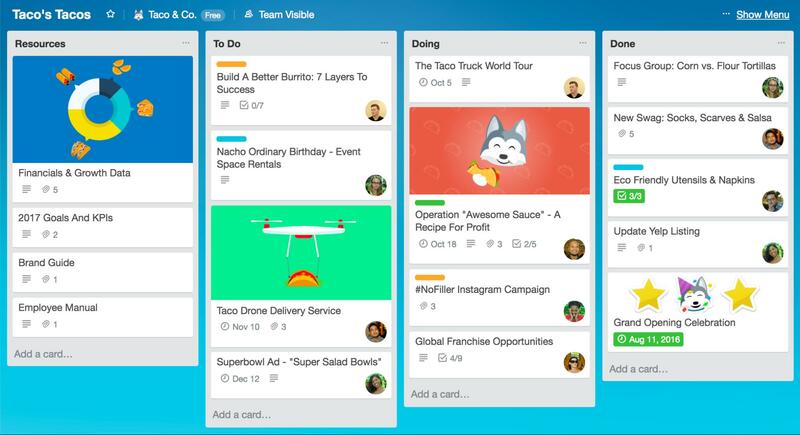 Trello’s design philosophy is centered around collaboration and visual work management and is not ideal for businesses that need more than a visual organization of work and checklists. Trello has been widely used by companies like Google, Red Hat and Adobe where small groups need a collaborative platform to manage their daily activities. Trello has two plans: Business Class and Enterprise that allows unlimited integration (called Trello Power-Ups) with tools like Evernote, MailChimp, Jira and more, along with basic security and file encryption policies. Trello also offers a true free forever version. Visual and lightweight task collaboration app. Pre-made boards and templates for different types of projects. Easy to learn and intuitive UI. Light on features – lacks Gantt charts, time tracking, resource management, billing, and reporting capabilities. Basic security, even with the Enterprise plan. As the number of boards and teams increases, the interface can get messy. ProofHub would be your best bet if you are looking to facilitate project management and team collaboration for marketing and creative teams for small businesses. It includes everything that is needed to run your marketing projects efficiently keeping track of every detail giving you real-time visibility into everything your team is working on. ProofHub is a straightforward software that does not complicate project management any more than necessary and includes only the essential features like task management, time tracking, online proofing and approval, kanban boards, discussions and group chats, and reporting. ProofHub is used by leading organizations like Netflix, TripAdvisor, Nike and many more. The software is available in two variants: Essential and Ultimate Control. Both of these options are charged a flat fee for an unlimited number of users, rather than charging per user. Seamless communication and collaboration capabilities. No per user license fees. Not optimized for slow internet connection and may face occasional interface annoyances. If your organization needs an all-in-one solution for managing customers, tracking sales to invoicing automation, then Scoro should be on your shortlist. It has a tidy set of features suitable for small to medium-sized teams and enables the users to unify data across their CRM, billing and work management tools, thus eliminating the need for separate tools. Scoro is an end-to-end business management solution that allows client-based businesses like agencies to eliminate routine project management tasks and streamline the entire workflow from one place. Brands like Air Guru, Grant Thornton, and WSI trust Scoro to run their businesses smoothly and efficiently. Scoro comes in three plans: Plus, Premium and Ultimate. All plans require a minimum 5 user sign-up. The tool comes with plenty of customizations. Out-of-the-box integration with all popular accounting systems like QuickBooks and Xero. Covers a broad spectrum of business – from sales right through to billing. Lacks core project management features such as Gantt charts, sub-tasks, critical path, resource load charts, etc. Needs onboarding services for successful adoption. Launched in 1986, Microsoft Project was one of the first project management software to be made available to the common public. And today, it has become the defacto standard with 67% of project managers using it. However, Microsoft Project was built on the premise of a personal desktop computer and that philosophy has stayed with it over all these years. 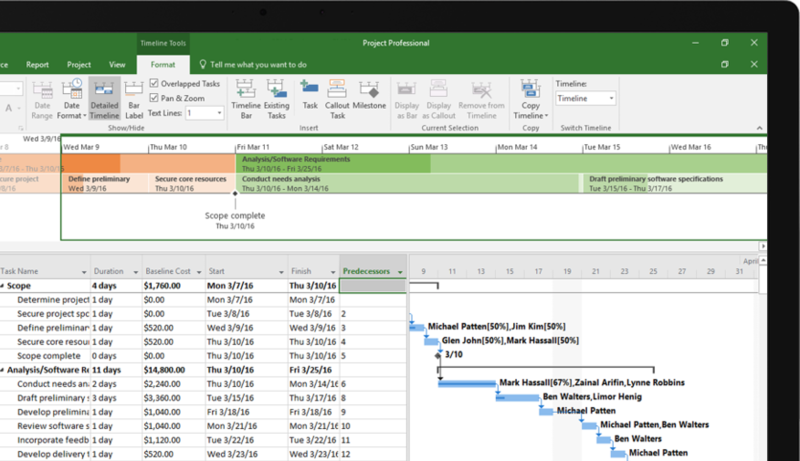 While Microsoft Project is not just a fuzzy old tool from the 80’s, it is still very much a project manager focused tool that is too complex for most teams, lacks collaboration and integrates only with other Microsoft Solutions. With today’s dynamic teams and projects, organizations are needing uncomplicated and forgiving tools to track their work with some flexibility for project management and work collaboration. More than just an online project management and Gantt chart tool, Celoxis is a comprehensive system that tackles real-world project management issues, has excellent collaboration capabilities and integrates with over 400 other business applications. Not to mention it works perfectly on Mac OS too, which has been a frequent complaint from the MS Project community. When compared to Microsoft Project, it’s almost 60% cheaper in price, yet full-featured and is a great balance between ease-of-use and power with a wide variety of reports. You won’t find a better Microsoft Project alternative. 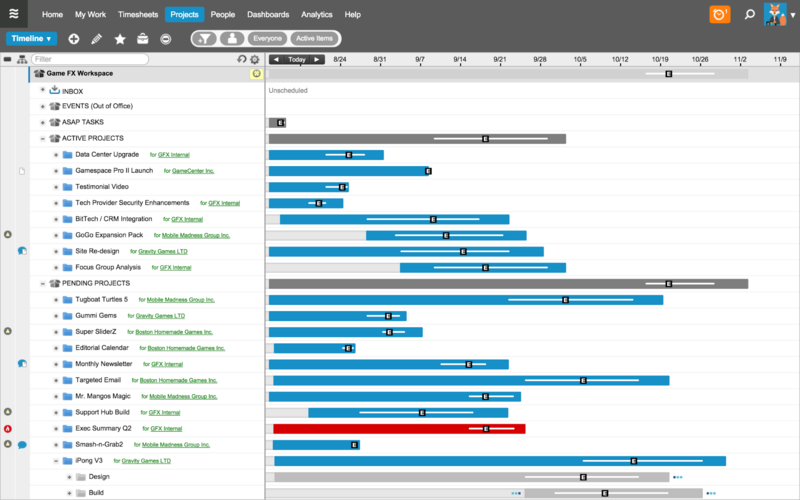 Gantt charts are arguably Celoxis’ most-loved feature making it Capterra’s one of the standout Gantt chart software options available. Celoxis ranks higher in portfolio coordination, budgeting, and cost tracking, ROI forecasting, time tracking, expense management, collaboration, reporting, bug, and issue tracking according to G2 Crowd’s in-depth user research reports. Celoxis has a higher user adoption than Microsoft Project for small business and mid-market businesses. Sadly, till date, when clients think of projects, they still think of Gantt charts and Microsoft Project. It still remains a staple of enterprise-level project management despite all the problems it brings along. Microsoft Project is still relied on heavily due to its longevity in the industry as a tool and its perceived legacy among project clients. Microsoft Project is the behemoth of the project management software industry. It is the dominant PC-based single-user project management software in today’s marketplace. Microsoft Project works only on Microsoft Windows. While it supports all the typical things you’d want to do in a project management app, one cannot emphasize enough that the tool is meant to be used by experienced and trained project managers. The user interface is very similar to other Microsoft Office apps, which comes much to the relief of organizations who are already a Microsoft house and invested in other Microsoft products. Powerful and built-in integration with Microsoft software suites like Office 365, Sharepoint, and Skype. Prominence in the industry with 20 million users and over 10,000 organizations. The tool has a set of high-quality tools and offers a lot of flexibility and customization for power users. Demands a very high learning curve and reliance on a certified project manager on board to drive the software. Users frequently complain that once the beginning is understood, it requires patience and training to advance one’s scheduling skills. MS Project is highly complex, unintuitive and unforgiving software, and even after rigorous training, users do not know how to use the flexibility correctly. Customized reports are difficult to create and require additional tools like Power BI. 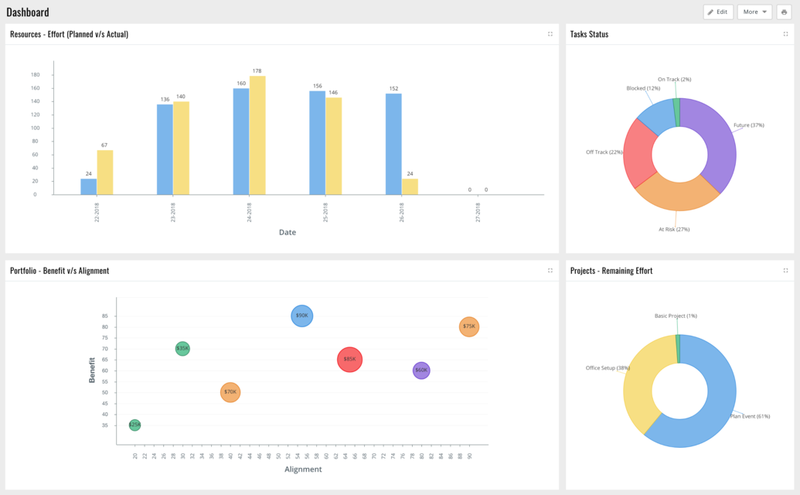 Lack of real-time dashboards makes it hard to stay on top of projects. 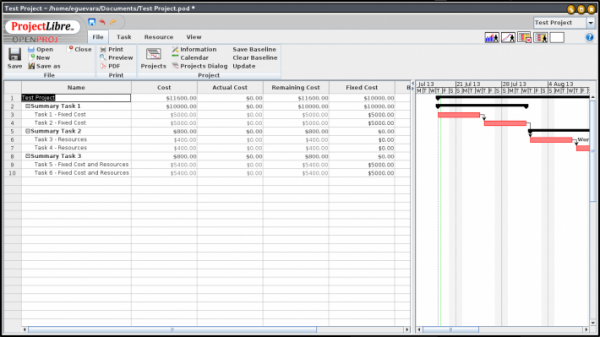 ProjectLibre is a free and open source desktop application that is designed to pretty closely emulate Microsoft Project. It has many similar functions to MS Project and is a good alternative for small projects where you don’t need the office suite integration. It includes key features like Gantt charts, network diagrams, indented WBS, earned value costing and resource histograms. It handles single projects quite effectively and is a good tool for monitoring schedule and keeping track of various tasks. ProjectLibre has a lengthy list of Fortune 500s, government offices, and non-profits adding stars to its reputation as a project management software. A for-fee, cloud-version is in the offering soon. Open source replacement for Microsoft Project desktop that is free to use and supported by the global community. Easier learning curve than MS Project. Compatible with Microsoft Project files. While the company openly proclaims itself as the open source replacement of Microsoft Project, the users of the software complain of a significant number of bugs and lacking a lot of features and functionality. The interface is dated, clunky and lacks flexibility. Limited reporting capabilities. Lacks collaboration and file sharing capabilities. nTask is a free online project management software that focuses on eliminating the need to shuffle between tools. It offers 7 modules built natively inside the tool that takes care of important matters such as task management, project planning, and reporting, meetings, risk management, bug, and issue tracking and more. The user interface is beautifully designed and simplicity is key with nTask. Everything is fairly simple to understand. With meeting management, Scrum teams can document daily Scrums easily. nTask also plans to introduce Kanban boards to facilitate board users soon. Let me add one more tool. 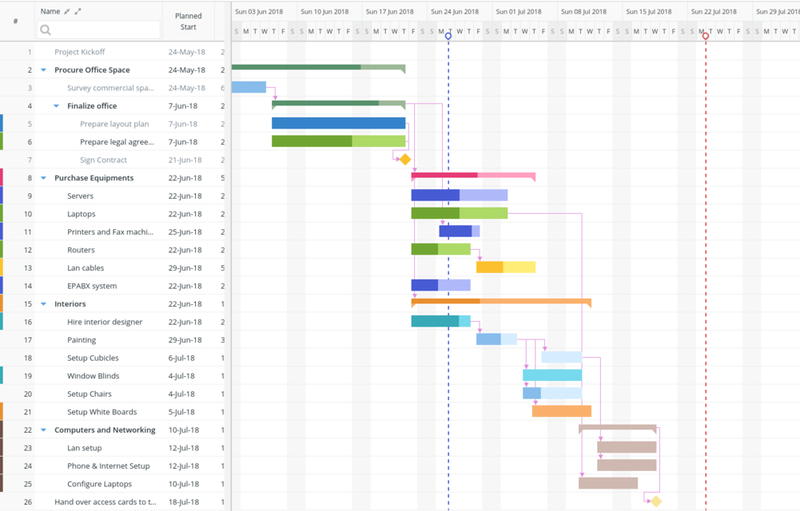 I would classify it as "Best for project visualization and getting easy-to-read timeline" - GanttPRO Gantt chart software https://ganttpro.com. However, it offers far more features than a simple Gantt chart view: progress tracking, deadline management, resource management, cost management, personal calendars, undo, baseline, collaboration, resource workload. Notably that the learning curve is quite short and after spending a few minutes in the app, you'll be able to create your first project. These are all great applications. If you don’t not mind, please check out Fanurio: Fanurio (http://www.fanuriotimetracking.com) can do project management, time tracking and invoicing. It can be used on Windows, OS X and Linux. A license costs $59 and you can use it forever.